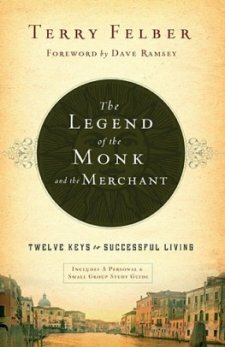 The Legend Of The Monk And The Merchant is a fable and allegory set in 15th and 16th century Italy that seeks to provide an apologetic for the legitimacy of businessmen and a focus on the marketplace within Christianity. It comes with a foreword by Dave Ramsey that hints at the importance of the book within evangelical circles along with a personal and small group study guide that takes up more than a third of the size of this small work (weighing in at a modest 180-odd pages). The book as a whole is a frame story, as an old man teaches his grandson twelve sensible and practical lessons about life and business, including the wisdom of tithing, the importance of partnerships, taking personal responsibility, using challenges as a stepping stone to success, avoiding debt and lending and living below one’s means, and being bold before men but humble before God. These lessons are introduced within the story as an old Antonio tells his bright grandson Julio about a series of meetings that he had with his own merchant who helped him see that the marketplace was his vocation. The book as a whole tends to take a somewhat defensive tone about the legitimacy of the businessmen within Christianity, reflecting a hostility to exclusive claims of the clergy. The book openly proclaims the doctrine of the priesthood of all believers, rightfully claiming that all Christians have the responsibility to lead godly lives and perform a ministry in whatever task or vocation that they have within the world, even if they are not paid for their work of ministry. In addition, the book strongly advocates the use of wealth gained through business to serve congregations (and tithing), especially those ministries who accept and bolster the legitimacy of the godly role of the businessman. There appears to be a hint of the carrot and stick here, as those ministries which espouse a pietistic and anti-business message can expect to lose those members who are devoted to serving God and achieving success in all aspects of life, including their material wealth to other ministries which greater appreciate Christian responsibility within all spheres of human activity. Those who are looking for a biblical message that supports the legitimacy of businessmen will particularly appreciate the references of scripture that help to ground the story in more substantial truth than its allegorical design, and the book openly engages in debate over what meekness means and the lack of general applicability to Jesus’ message to the rich young nobleman to give away all his wealth. That said, there is one massive gap in this book’s approach to the legitimacy of the marketplace and those who succeed in it, and that massive gap is the failure of the book to examine the specific body of biblical law that reflects the biblical regulation of conduct in the marketplace. While the principles this book discusses are all sound and reasonable, it is not the success of businessmen that leads to their lack of legitimacy in some eyes, but their ethics (or lack thereof). By failing to provide strong instruction on the nature of biblical law that remains valid for businessmen (including the prompt payment of wages to employees, having honest weights and measures, avoiding bribery or partiality), the book fails to provide guidance on what specific instruction and regulation God’s word provides for conduct in the marketplace. Without that instruction, the desire for successful businessmen to receive the adulation and credit of the paid clergy and the partnership between God and wealth can simply devolve into the praise of the statutes of Omri and will fail to reach the moral heights of adherence to and modeling of righteous obedience to God’s laws. The goal of the author in defending the legitimacy of businessmen as godly would have been greatly served by a focus on what God’s law has to say about godly behavior in the marketplace, as a demonstration of the commitment of Christian businessmen to live and work in obedience to God’s laws. The failure to provide this focus and instruction while seeking legitimacy was a major missed opportunity. Given that the author seems to pit Sodom’s sins of immorality against their greed and exploitation of the poor, it would appear as if a greater appreciation for biblical law (including aspects of personal morality) would be greatly of use in promoting the legitimacy of the Christian businessman (or woman). Another shortcoming of this work is the way in which the author seems to twist the meaning of king and priest to take what it means to be a king out of context and focus it mainly on the marketplace. The division between king and priest focuses on the separation of church and state, where king refers to those involved in civil affairs. These can be extended to the marketplace, to cultural realms (like music and entertainment and arts), or to academia, but they start in civil realms dealing with political affairs. The fact that the book seems to take no interest in questions of how Christianity should influence our view on policy and law but takes a great deal of interest in the search for material success is also a curious gap that may be related to the ambivalence of the evangelical view of Christian involvement in politics or the applicability of biblical law to Christian behavior. At any rate, there are many people (myself included) who appreciate works which seek to present godly businessmen in action and who graciously accept and promote the legitimacy of the marketplace as an avenue for Christian ministry. This book could have been made much better by addressing the larger question of kingship outside of the marketplace and examining the body of biblical law that shows what conduct within the marketplace will be blessed by God. Perhaps these shortcomings can be addressed either in a future edition, or in another book. This entry was posted in Bible, Book Reviews, Christianity, Church of God and tagged business, debate, law, legitimacy, nonfiction, politics. Bookmark the permalink.